This Cycle: It's Not The Economy, It's China, Stupid! I know everything is fan-freaking-tastic - with the tax reform bill and global synchronized expansion and all. I figure the last thing you need is some nattering naysayer throwing cold water on this unbelievable party, so I won’t. 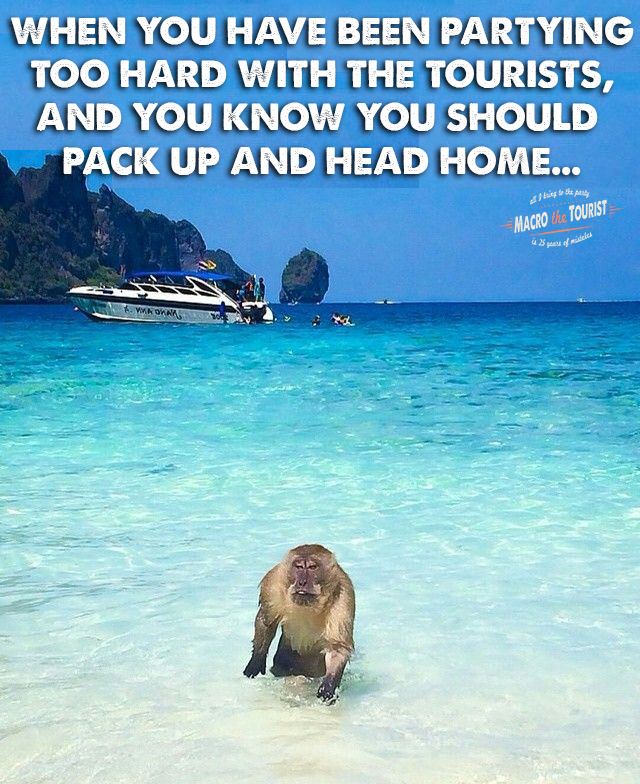 At least not for the short run. This rally will end when it ends. Maybe tomorrow, maybe next week, maybe next month, maybe next year. I don’t know and every time I try to guess, I just end up looking foolish. But I recently listened to this terrific Bloomberg Masters in Business interview of the legendary hedge fund manager, Felix Zulauf, and he articulated such a compelling argument for the timing of the next slowdown, I felt like Felix was my Spirit Bear. I have always enjoyed Felix’s viewpoint, but Barry Ritholtz did such a great job during this interview, that I have a new found appreciation for Felix’s career, and more importantly, his market calls. I had mistakenly assumed Felix was always bearish, but the truth of the matter is that he definitely switches from side to side, and is not the pro-typical Swiss hard money uber-bear. I didn’t agree with all of his economic philosophy by any means, but his market (and political) analysis was some of the most compelling dialog I have listened to in quite some time. If you haven’t heard it, then give it a listen. If you don’t want to take the time, don’t fret - I have transcribed the most important part for you. Longtime readers will instantly see why Felix’s theory appealed to me. I have long argued that China’s fiscal and monetary policy might be the most two important variables when it comes to forecasting the global economy. And here was Felix making the case that the entire global economic cycle is being driven by China. Felix - you had me at hello. Now, make no mistake. This is a longer-term call. It’s not going to affect market prices next week, and probably not even next month. But in the coming quarters, it has the potential to be the most important determinant of financial asset performance. I will take a little more nuanced approach to Felix’s theory, but in broad strokes, I completely agree with his analysis. The Chinese government will not allow their 100th anniversary be anything less than a rocking success. And President Xi is smart enough to know that he can’t just keep the pedal to the metal for the next four years and hope that the economic expansion lasts. Remember all the dire warnings from your favourite star hedge fund managers about China’s coming collapse? Well, I don’t want to be prematurely counting any chickens, but it looks like Xi & Co. have managed to successfully navigate another year without the end of the world financial Armageddon scenario coming to fruition. And it’s not like this has been achieved through growth-at-any-cost with super easy monetary policy. In fact, during the past year, both interest rates and the Chinese Yuan have risen. It appears as if, bit-by-bit, China has slowly tightened monetary policy. And I suspect that trend will not only continue, but even accelerate from now. President Xi will continue strangling the excesses out of the Chinese financial economy through tighter monetary policy. 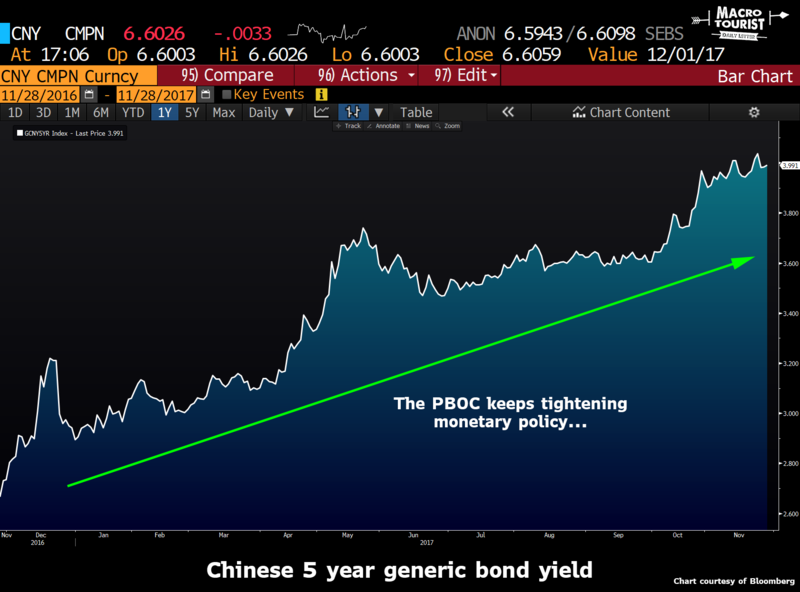 The PBOC won’t plunge China into a recession, but instead slowly choke off the speculative froth. Now here is where I will expand on Felix’s theory. China is in the midst of a massive infrastructure spending program with their One-Belt-One-Road initiative. The program is massive, and entails many complicated and extensive transportation system upgrades in all parts of their country. This sort of development is not something that you easily turn on and off. And nor should it be. This is true investment in the future of China. Much like Eisenhower’s interstate highway program that set up America to become an economic powerhouse for decades to come, China’s OBOR initiative is a crucial step for China’s development. Xi will not alter this plan. The course is set, and the money will be spent. Yup, that’s crazy. 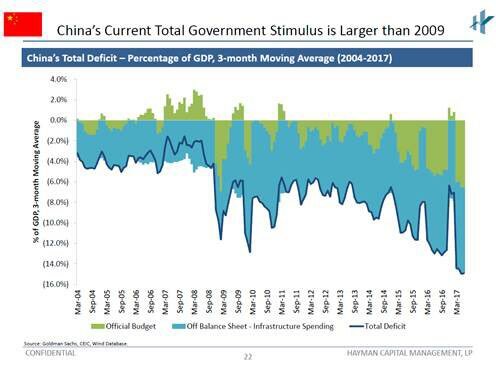 China is running a fiscal deficit of 14% of GDP. Any wonder why the global economy is cruising along so nicely? It sure helps when you have this sort of fiscal stimulus wind in our sails. Will Xi tap this back? Sure, he might try to trim around the edges, but the reality is that he will not make any meaningful cuts to the OBOR policy. 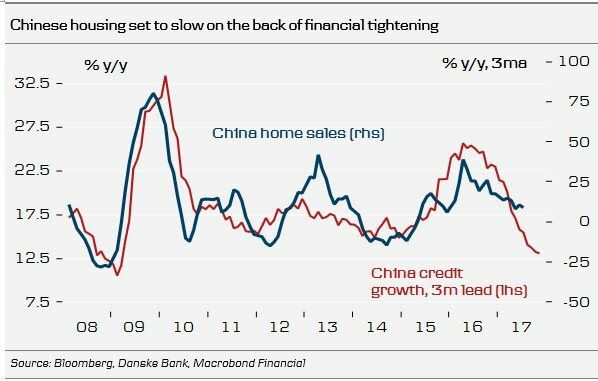 Therefore, China will be running a hot fiscal policy for years to come, and the only way to counteract its effect, will be by tightening on the monetary side. This will also have the added benefit of causing the financial economy to slow. In fact, we are already seeing this play out in the housing market. Everything started to come together at that time. Not only was I trading on my own without any interference, but that same eastern European situation led to my first truly major trade for Soros’s Quantum Fund. I never had more conviction about any trade than I did about the long side of the Deutsche mark when the Berlin wall came down. One of the reasons I was so bullish on the Deutsche mark was a radical currency theory proposed by George Soros in his book, The Alchemy of Finance. His theory was that if a huge deficit were accompanied by an expansionary fiscal policy and tight monetary policy, the country’s currency would actually rise. The dollar provided a perfect test case in the 1981-84 period. At the time, the general consensus was that the dollar would decline because of the huge budget deficit. However, because money was attracted into the country by a tight monetary policy, the dollar actually went sharply higher. When the Berlin wall came down, it was one of those situations that I could see as clear as day. West Germany was about to run up a huge budget deficit to finance the rebuilding of East Germany. 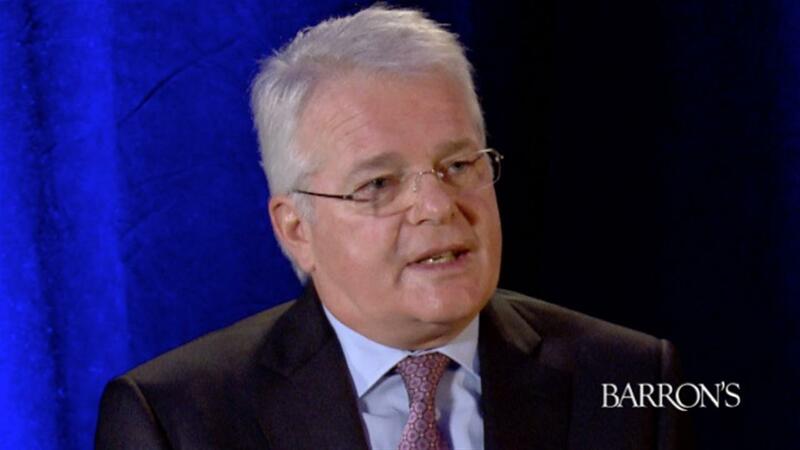 At the same time, the Bundesbank was not going to tolerate any inflation. I went headlong into the Deutsche mark. It turned out to be a terrific trade. 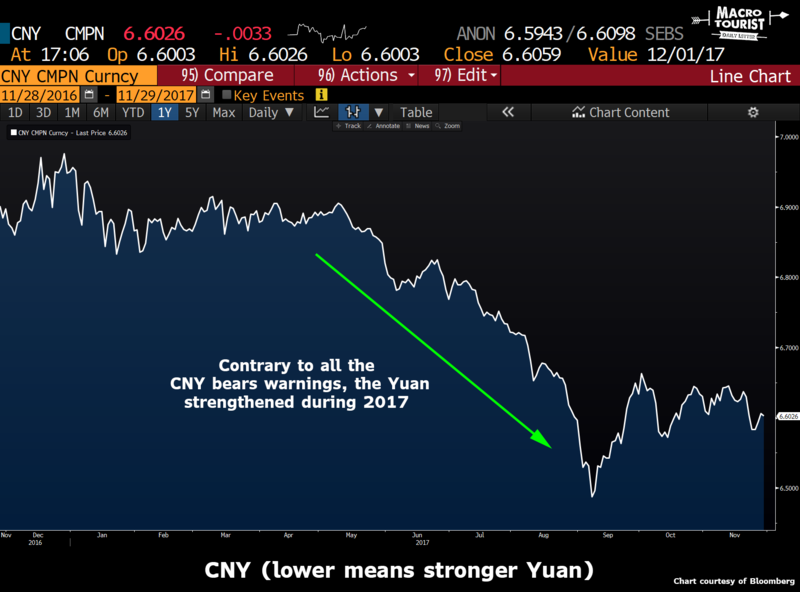 Now I know this isn’t the perfect analogy, but I can’t help but wonder if it will be more correct than all the Yuan bears who are predicting a China collapse. We have a Chinese President who wants to be re-elected shortly after his party’s 100th anniversary celebration in 2021. Therefore, it will be important that the Chinese economy is humming along at full speed at that time. To do that, he needs to stimulate in 2020, but the problem is, if he doesn’t tap the brakes now, he might risk overheating before then. President Xi will therefore take the hit, and get the pain over with in 2018 and 2019. Yet the story is further complicated by the fact that China’s long run infrastructure program is causing a hot fiscal policy. All of these factors add up to a much tighter PBOC for the next couple of years. Call me an idiot, but I am tempted to take the long Yuan trade. I know that seems insane - all those really smart hedge fund managers are all forecasting a China collapse. But buying Yuan is probably better than betting on stocks going down because of the tight Chinese monetary policy. Not convinced it’s the best trade, and not even sure if I am going to do it in any real size, but I have often found the hardest trades, are often the best trades.